In this interview Dave Balter explains word-of-mouth marketing. Balter founded BzzAgent in 2002. His company has provided word-of-mouth media services for dozens of Fortune 500 companies and has been featured in The New York Times Sunday Magazine, The Wall Street Journal, The Economist, and on National Public Radio. He is also co-founder and current board member of The Word of Mouth Marketing Association. Balter earned a B.A. in Psychology from Skidmore College. 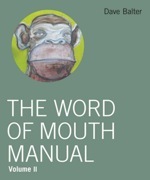 He recently published a book called The Word of Mouth Manual, Volume II. You can download a full (and free!) copy of the book here. Question: Can a large company do it—or is word-of-mouth marketing only for small companies? Answer: Word of mouth happens for companies of all sizes. The iPod and the iPhone were massive word-of-mouth phenomena. So was the Swiffer. Smaller companies, like Webkinz, may need to rely on word of mouth more due to smaller marketing budgets, but the impact is equally valuable. Question: What are the components of an effective word-of-mouth marketing program? Unpaid. Cash messes with our opinions! Open. If someone is involved in an organized word of mouth program, the people they talk to should be aware of that. A simple test is to ask yourself: would I feel ok if my eighty-year old grandma knew about this program? That will help guide you. Question: What is the difference between viral and word-of-mouth marketing? Answer: Viral marketing is typically reserved for programs where the advertising is talked about as opposed to the product itself. A good example are viral videos, where the humor trumps the brand, ala Cadbury Schweppes drumming gorilla video—humorous partly due to the Phil Collins soundtrack, of course—and the parodies which followed). Word of mouth is the actual sharing of an opinion about a product or service between consumers. Your viral marketing only works if it gets people talking about the product itself. If it doesn’t, you might create some laughter and awareness, but there won’t be a change in sales. Question: How long does an episode of word-of-mouth communication last? Answer: At this stage BzzAgents have generated north of 100 million conversations. From the data we’ve collected, each conversation lasts more than six minutes. But this isn’t like traditional marketing—it’s not a one way advertisement. Typically word of mouth dialogues includes discussions about other competitive products, personal experiences, pros and cons. It’s all of the things that help us really understand a product’s value. Question: What does a person do after purchasing a product—using word-of-mouth juice? Answer: “Word-of-mouth juice”— do you mind if I borrow that term for the title of my next book? To answer your question, this “juice” is what made the iPhone so amazingly successful. People felt obligated to show someone else. Partly out of excitement, but also to be ‘validated’ for making the decision to wait in line, plunk down the cash, and take the leap to get one. We call this the “pass along effect.” Shortly after purchase, many people generate the most word of mouth about a product—often to see how others react and to make ourselves feel good about the purchase. Question: What is the best way to reward—indeed, if you should reward—people who do word-of-mouth marketing for a company? Question: What makes a new product like the iPhone become “urgent”? Answer: Steve Jobs has figured out a word-of-mouth blueprint that’s pretty incredible. When they launch a product, information is scarce and supply is limited. Before anyone even sees one, they’re talking about how they want to buy it. Of course Apple can pull this off because it makes great products that blow away expectations. Also, Apple develops tremendous advertising, which is worth talking about in itself. Word of mouth doesn’t replace great advertising, it just helps great advertising perform better. Question: How can a company make a sample of its product the most powerful? Answer: Every company wants to get their product into people’s hands. Trial is clearly an incredible way to create buyers, but a tremendous amount of sampling is wasted. Imagine you went to a ballgame and there were people outside the park handing out little packs of Tums. The company may give away hundreds of thousands of trials, but how many of the recipients needed heartburn medicine? How many of them were thrown out? Most importantly, how does the company know if people liked them or used them or thought they were a headache remedy? So rather than the random shotgun sample approach, companies should start online by inviting people to request a sample and then giving them a way to report back their opinion and, most importantly, how they shared that with others. The result: 100% engagement and data you can actually use! Question: Do you believe in the theory of top-down, elite influencers? Answer: I believe in Influentials, Trendsetters, Trendspreaders, Sneezers, Alphas, Bees, Hubs, Mavens. These “special people” do exist—but companies should be careful on their reliance on tremendously influential people to help spread their opinions. Often there’s a mismatch between someone’s enormous network of friends and their interest in trying a specific product and to share it with others. Companies should focus on finding people who really want to be involved with their product. They should focus on helping these individuals learn about what makes their product unique and special to share with their networks. However, it all starts with a great product. Few will care if a product doesn’t meet expectations. Question: What exactly does your company do? Answer: BzzAgent is a word-of-mouth media company. We have nearly 450,000 volunteers who learn about products and services through our network and share them with their friends in an open, natural way. We do our best to provide something for everyone. For example, people who dig websites and other digital initiatives can hang out in our Frogpond to find out about what’s cool. Do you like tasty food or cool cleaning products? Sign up for our network and you may get into a campaign for Back to Nature Nuts or a new plug-in air freshener, and we’ll send you out some samples to try, and then you share your opinion however you’d like! Question: What’s your assessment of Alltop’s word-of-mouth potential? Alltop is worth talking about (it’s made it so easy for me to find great food sites!). The sites that get listed want to tell their own networks, so it’s naturally viral. The semi-transparent navigation bar is unique; whether you like it or not, everyone has a perspective they want to share. Plain and simple: It’s worth yapping about. Don’t forget to download the full and free version of Dave’s new book here for much more information about word-of-mouth marketing. If you want more marketing news, check out Marketing.alltop.com.